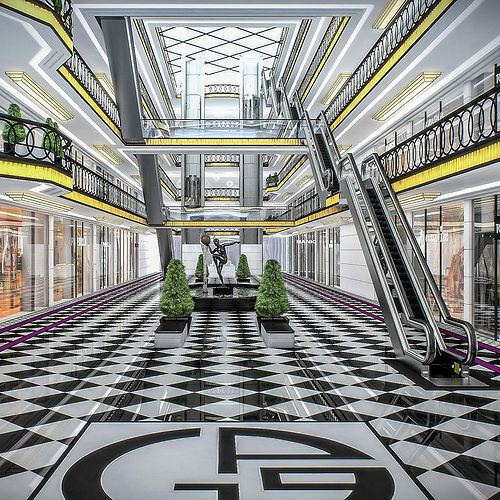 This is a model of real world 6-storey Shopping Mall interior made by professional architect. PRESENTATION IMAGES =================== There are 55 VRayLight (54 of them are instances) and VRaySun in scene. All preview images are rendered with 3.20 V-Ray. Product is ready to render out-of-the-box. MATERIALS ========= This model contains V-Ray materials, JPG and TIF textures. All objects are UV mapped. All materials are named properly. In the wireframe renders i dont see: bench,plant, and statue. Are they in the model you are selling?